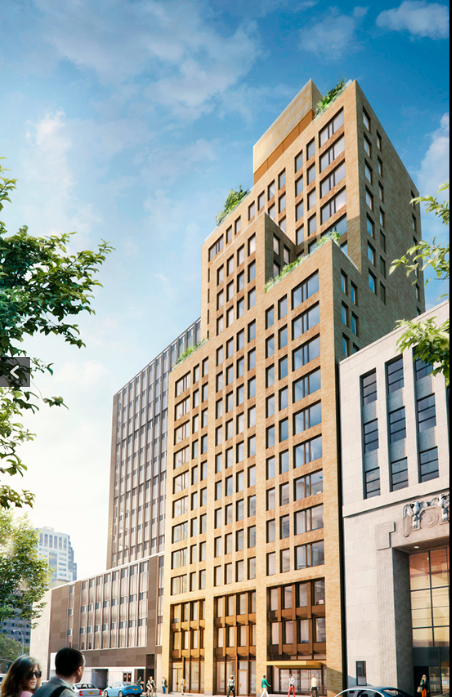 BROOKLYN HEIGHTS – Applications are now being accepted for 23 affordable units at a new rental development at 146 Pierrepont Street (between Clinton Street & Cadman Plaza West). The Pierrepont features 128,000 square feet of residential space and 86 “family-sized homes,” twenty-percent of which are set aside for affordable units. The residences are split between two 19-story towers connected by a two-level retail base, 6sqft reports. The affordable units are reserved for applicants earning 40%, 60%, or 130% of the area median income (AMI). Available units for those earning 40% AMI include 4 studios at $596/month and 5 one-bedrooms at $685/month. Annual household income requirements range from $22,389 – $29,240 for single applicants and $25,509 – $33,400 for couples. There are 9 two-bedroom units at $1,183/month set aside for households earning 60% AMI. Annual income requirements for these apartments range from $42,618 – $50,100 for couples and $42,618 – $62,580 for families of three to four. Available units for applicants earning 130% AMI include a studio at $2,320/month; a one-bedroom at $2,487/month; and 3 two-bedrooms at $2,993/month. Annual household income requirements range from $79,543 – $135,590. Designed by Marvel Architects, The Pierrepont offers amenities including an attended lobby, on-site resident manager, fitness center, lounge, children’s playroom, roof terrace, and a laundry room. Preference will be given to current residents of Brooklyn Community Board 2 (50%) which includes Boerum Hill, Bridge Plaza, Brooklyn Heights, Brooklyn Navy Yard, Clinton Hill, Downtown Brooklyn, DUMBO, Farragut, Fort Greene, Fulton Ferry Landing, Vinegar Hill, and Wallabout, as well as municipal employees (5%). A percentage of units will be set aside for applicants with mobility (5%) and vision/hearing (2%) disabilities. The deadline for applications is Wednesday, March 27. Click here to apply. Check out NYC Housing Connect for more information on how to find and apply for affordable housing.